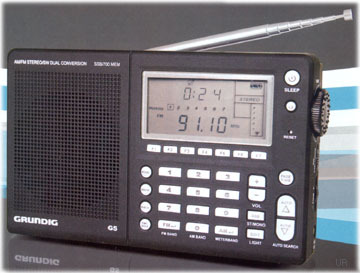 The Grundig G5 is a world class portable radio covering long wave, AM, FM and shortwave. It features dual conversion AM/SW circuitry for exceptional sensitivity and image rejection. It offers S.S.B. - Single sideband reception. It has an amazing 700 channel memory capacity with memory scan and auto tuning storage. The 24 hour clock features alarm and sleep timer functions. Tuning is via auto-scan, manual scan, conventional tuning knob or direct keypad entry. FM stereo is supported to the mini earphone jack. There is even a Line Output jack to feed a tape recorder or external audio amplifier. The LCD display can be illuminated one of three ways. In Normal Mode pressing any button activates the display. While plugged into the AC outlet the always-on mode illuminates the display whenever the radio is turned on. In Manual Mode the dial will light for 15 seconds when the light button is pressed. Other refinements include: Local/DX Switch, Wide-Narrow selectivity and external shortwave antenna jack. The G5 operates from four AA cells (not supplied) or via the supplied AC wall adapter. The supplied AC adapter can also recharge NiMH AA cells (not supplied) while in the radio. (Do not attempt to recharge other types of AA cells). 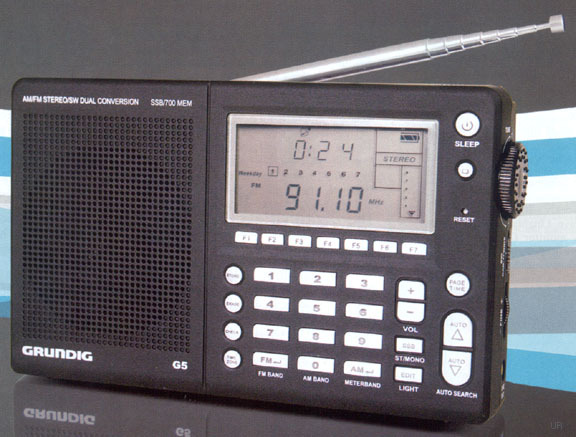 This radio also includes a multi-language Owner's Manual, wrist strap and protective case. 6.675 x 4.125 x 1.125 inches 12.2 oz (168x105x29mm 346 g). One year limited warranty.